Leon Silverman, General Manager of Disney Digital Studio Services, was recognized with the Hollywood Post Alliance (HPA)’s Lifetime Achievement Award for his contributions to post production on November 12, 2015, at the Skirball Cultural Center in Los Angeles. During the event, people spoke not only of Leon’s contributions within the industry, but also focused on how he was able to mentor and personally impact so many of them. Seth Hallen, Sony DADC New Media Solutions, described Leon as “a man with a thousand people who call him a mentor.” Leon believes strongly in building relationships and according to Michael Cioni, Light Iron, Leon teaches that it’s “more important to collaborate than it ever will be to compete.” In honor of Leon’s mentoring, the HPA has started The Leon Silverman Media and Entertainment Internship Program for college students and young professionals in the media and entertainment industry. Speakers shared stories of Leon as he was growing up through the industry. A common theme was how driven Leon has always been. Coming out of college, he landed a job at Compact Video in their Shipping and Receiving department. Where Leon really wanted to be was in their sales department. Within three months, he worked his way into sales and within five years, Leon was the head of the group.During the event, people spoke not only of Leon’s contributions within the industry, but also focused on how he was able to mentor and personally impact so many of them. Seth Hallen, Sony DADC New Media Solutions, described Leon as “a man with a thousand people who call him a mentor.” Leon believes strongly in building relationships and according to Michael Cioni, Light Iron, Leon teaches that it’s “more important to collaborate than it ever will be to compete.” In honor of Leon’s mentoring, the HPA has started The Leon Silverman Media and Entertainment Internship Program for college students and young professionals in the media and entertainment industry. He then left to join LaserPacific Media Corp, which was acquired by Eastman Kodak. Leon was named President of LaserPacific Media and VP of Entertainment Imaging. During this time Leon helped shape innovations that pushed the industry forward, such as electronic video finishing and non-linear editing. While change may be scary for most, Leon embraces “being comfortable with being uncomfortable,” said Michael. When Leon started at LaserPacific, he etched his name in the concrete and 33 years later his name is still etched on the sidewalk as is his legacy there. 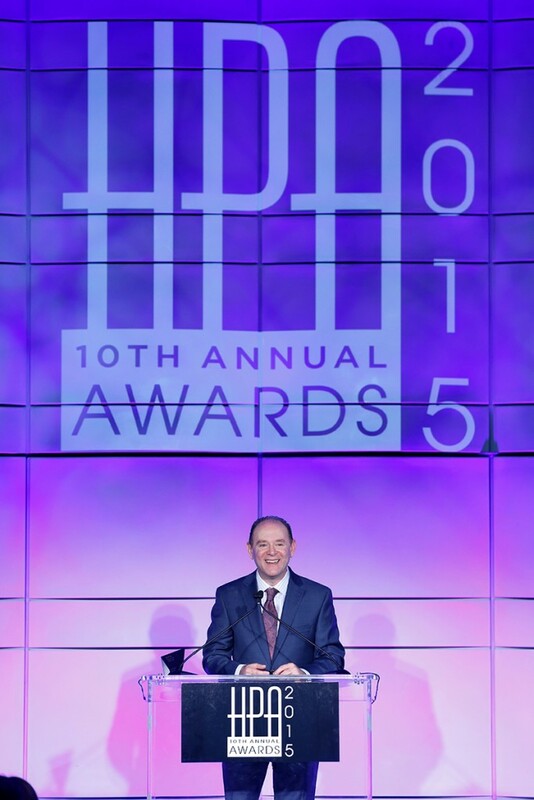 Leon accepted the HPA award, thanking all those who have helped him in his career and personal life. He noted that he was thankful to be able to “teach a little bit, but to learn so much” from those he has worked with in the past three decades. Leon’s a big believer that your greatest work lies ahead of you. If that’s the case, we are all eagerly waiting to see what Leon has in store for us next.